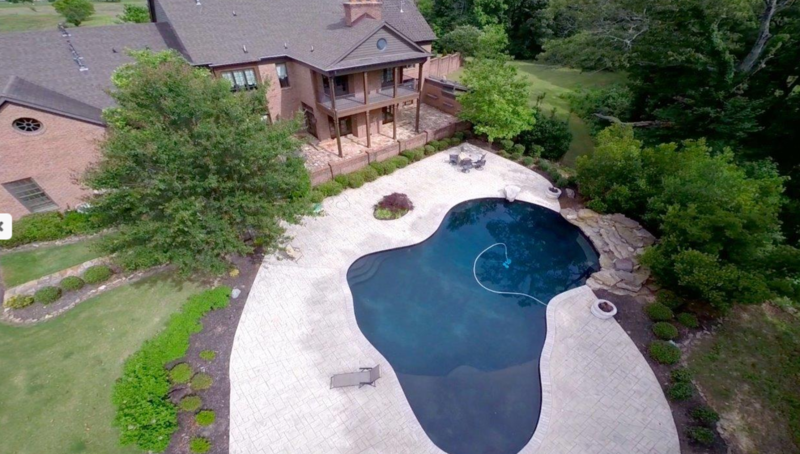 SENATOBIA, Mississippi (June 6, 2017) — Two large, luxurious homes with saltwater pools, waterfalls and expansive views are set for auction July 6, along with grazing and pasture land — all within a half hour’s drive of Memphis. “For luxurious pastoral living, this is about as good as it gets. We have a Tate County farm with elegant homes of 8,500 square feet and 4,100 square feet. Each features extensive stonework, balconies and large areas for indoor and outdoor entertaining, and each is selling separately,” said Jim Woltz, president of Woltz & Associates, which is managing the auction. The farm has a total of 822 acres, as well as a lighted round pen and horse stall. It is being offered in 11 tracts (including the two tracts with the homes). A second farm, located three miles away in Panola County, has 1,254 acres of quality pasture, which will be offered in 10 tracts. The Panola County farm features the Grandview Plantation Auction Sale Barn, as well as a lake of approximately 60 acres with large bass. “The large sale barn is set up for livestock auctions, and it could also be converted to a horse facility,” said Woltz. “Each of these farms is self-contained, with farm buildings, fencing and water. But they’re close enough to be managed as a single operation. This auction could go several different ways. Bidders could buy the high-end homes on the Tate County farm, along with some adjacent land, and use them for equestrian estates. Or someone could buy all of the property in both locations and manage them together,” said Woltz. The auction will begin at 211 North Main Street, Como, at 2 p.m. Auction personnel will be available to provide viewings of the homes June 10, 11, 24 and 25, from noon to 4 p.m. or by appointment. Individuals seeking additional information may visit www.woltz.com, or call 800-551-3588. Woltz & Associates, based in Roanoke, is a leading auctioneer of farms, homes, commercial properties and other real estate throughout the United States.